Took off from work today for my semi-annual dental check-up. No problems to report. My dentist is up in my old hometown, so I stopped by my parents' house for lunch first. I had asked my father to look for a few items I was hoping to use for reference for the A History of Art print, but he couldn't find them. 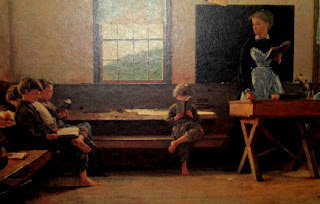 (there's a good chance they went in a garage sale years ago) But while I was looking around, he asked me to bring back down the shore a framed 22"x40" reproduction of Winslow Homer's Country School. He thought my brother wanted it to hang in his new place. Even before this errand today, I had been planning to make use of this image in the new print. This reproduction hung in my grandparents' house for many years, where it had fascinated me as far back as I can remember. I guess it's the first famous painting that I was familiar with, and so it's earned a spot on my tower. On the way home I stopped at the Studio to see the progress of construction. The other day Herb told me that the construction equipment was for the long awaited construction/installation of the dormers in the building's roof. These had been part of the original 1890's building, but were removed somewhere along the line. As part of the restoration they are going back, and one was indeed in progress today. I'll take some photos next time I have my camera there. Today Herb told me that construction would not interfere with access to the building, which was my big concern. Back home this evening I looked through my 6 hour tape of vintage Bugs Bunny cartoons for another visual reference (more on this later) and finally drew out a scale version of my measurements for the north wall of the Boatworks. The next step will be deciding how to make my mural idea fit this irregular space.